This was taken at the British Wildlife Centre in Surrey. This is a place where they do rehabilitation and conservation of british wildlife. They have breeding programs for some of the declining british species such as otters, red squirrels and water voles. They also have animals that can no longer live in the wild (usually because they were orphaned and hand reared by humans). The animals are in enclosures but these have underground burrows and plenty of trees and bushes. This means that the animals appear only when they want to - you can never tell what you will see. Most people hadn't spotted this fox as he was curled up in a ball asleep. I waited patiently until he woke and looked up. Delighted to see a beautiful posting from you this monday morning here in NZ! Captured well with a expression from it's face! Hi Karen. Well worth the wait. This is a very good close up of the Fox. great detail and natural loooking colours. he has his eyes on you. well done TFs. PS Is that a new 100 400 lens . What a beautiful Fox and what amazing eyes! I love the way he is still curled up from sleeping. Wonderful natural colors and marvelous details. The setting is perfect. I love the way he is looking at you. A wonderful and lovely capture of this fox with nice details, superb composition, framing. I liked its strong looking and eyes friend! Beautiful animal you photographed here. very beautiful shot.great sharpness and detail.wonderful colors. Quite collaborative fox that offered you a really good pose. Perfect, natural colours and an excellent composition. Excelente encuadre e iluminaci�n. La mirada es realmente sorprendente. Lovely pose - looks like my dog when she has just woken up! Excellent detail and colour too. It's so good the pose and expression you managed to get here. Found very appealing the contrast between the itense colour of its fur and the greens of the grasses behind. Congratulations and thanks for share it. Wonderful shot of this Fox and a fabulous eye contact - your patience paid off certainly. The glare is so scary. Nice colours and details. Excellent POV and composition. Kudos. Beautiful picture of this fox. Very good sharpness. Wonderful colours. Very expressive look. gorgeous portrait of this Fox. I think it could be a bit sharper so I did a workshop... I hope you don't mind! 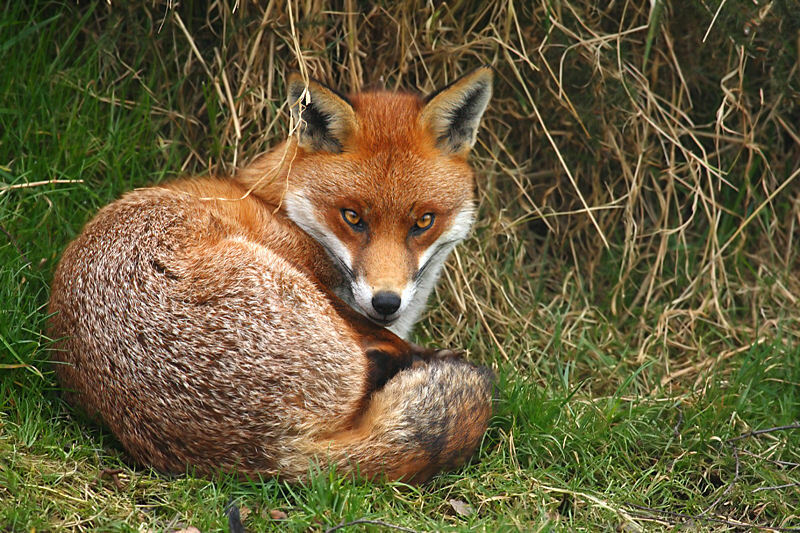 I love this charming fox, irresistible glance and love this skillfully taken image. Bravo. All is superb at this outstanding by subject and quality picture. emotionally very appealing charming portrait - so well balanced in its composition that it is looking like a perfect sculpture. And at the same time so lively and intensely in contact with the viewer. A wonderful image, taken with care and great patience. Thank you! This picture really takes the high score in cutenes. Just take a look at those eyes and yoou want to give him a big hug. Wonderful details all over the fox. Nice and natural colours and perfect composition. If this is the standard of the 40D I will look forward to save enough money to get my hands on one of these. Great job you did here - even when it is in a wildlife centre:-0). Excellent details and he really knows how to pose to look his best!